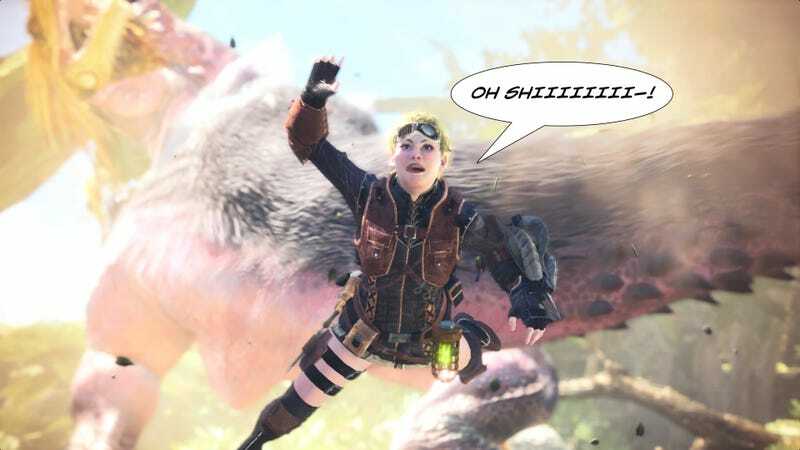 Kotaku’s review of Monster Hunter World will be coming soon. (Sneak preview: it’s pretty damned good.) In the meantime, here are a few of the things I like about it. This series has always been all about the beasts. They have such personality in their animation and behavior. The new creatures in Monster Hunter World are impressive, surprising, and brilliantly fun to fight. The familiar ones—Rathalos, Diablos, even the Barroth—have been given a 4K makeover. I love the way they interact with each other, too. I spent about ten minutes just watching a Rathian (big green dragon) and a Barroth (angry dino-rhinoceros) lay into each other on a quest last night. The premise of Monster Hunter World is simple—go out, kill or be killed—and yet there is such imagination evident in everything from the monsters themselves to the armor and weapon fashions to the lively, sprawling marketplace that houses all the characters. The aesthetic is a mash-up of prehistoric and pirates. There is a one-eyed cat captain who runs the canteen. There are little flashes of humor and personality in the most unexpected places. Palicoes, little cats that accompany you on quests, have been a fixture in Monster Hunter for years now. Functionally, they’re mostly there to distract monsters so that you’re not under constant assault. More importantly, they’re cute and hilarious. The first time I waded across a swamp I almost lost it when I saw that my cat-pal had whipped out her own little rubber dinghy and was paddling around with the tiny ukulele she uses as a weapon. 10/10 would cat again. I won’t spoil, but the Ancient Forest and Wildspire Wastes that featured in the beta are only two of the five gigantic, multi-layered environments in Monster Hunter World. Every time I discovered somewhere new, I spent hours on an expedition, exploring and feeling out monster territories. There are caves to get lost in, hidden traps to spring on your quarry, hideouts where wild cats live. It helps, too, that it looks so beautiful. I’ve been playing Monster Hunter games for a decade, so I’ve become so inoculated to the series’ more boring elements that I only truly appreciated how much they sucked when they were taken away. Monster Hunter World has no more mandatory mushroom-collecting quests. (Don’t worry though, amateur foragers, it’s still got optional ones.) The storyline isn’t padded out with tedious “kill X of Y” objectives. Instead you hunt big, proper monsters, one after the other. In between, you can do optional quests or objective-free expeditions for a bit of a rest. I’ve also spent much less time on inventory management. Monster materials, pickaxes, bug nets and other essentials no longer take up space in your pouch. I didn’t even realize until 10 hours in that you can head back to camp and deposit whatever items you’ve mined, fished and foraged, so you never run out of space. These quality-of-life improvements might not sound like much, but they save so much time and make playing so much more seamless. Kotaku’s review will be published in the coming days, after I’ve had some time with the game on live servers. It’s safe to say that I’ve not been disappointed.